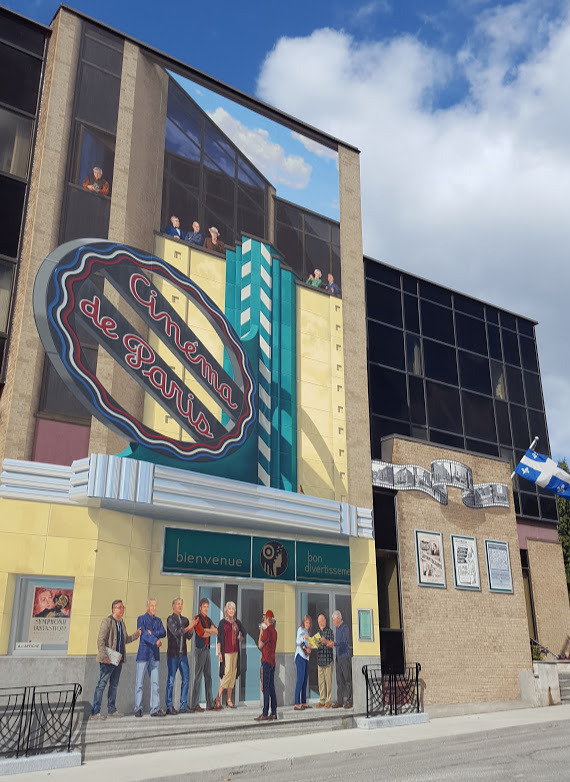 This mural at the corner of King and Camirand Streets is a tribute to the history of cinema in Sherbrooke. 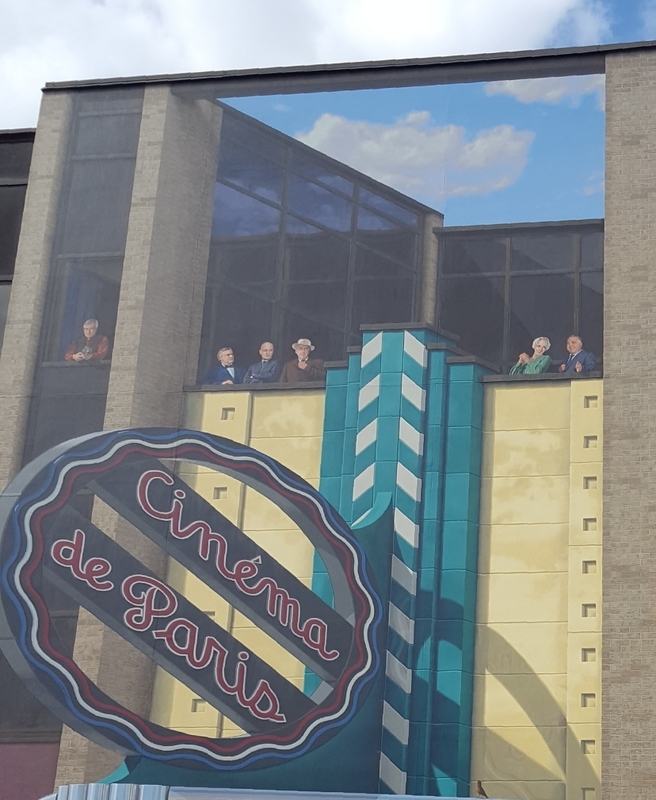 You can see the façade of the Cinéma de Paris, which used to be located very close. 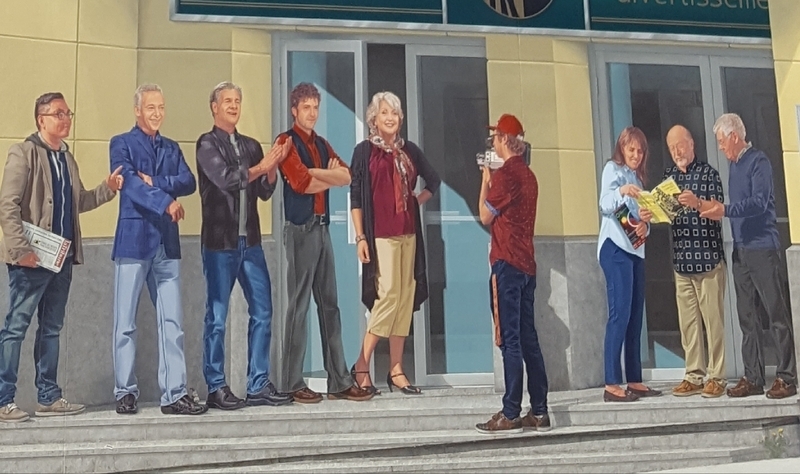 This mural showcases, among others, actors and comedians from the region, famous producers and directors, theatre people and filmmakers. 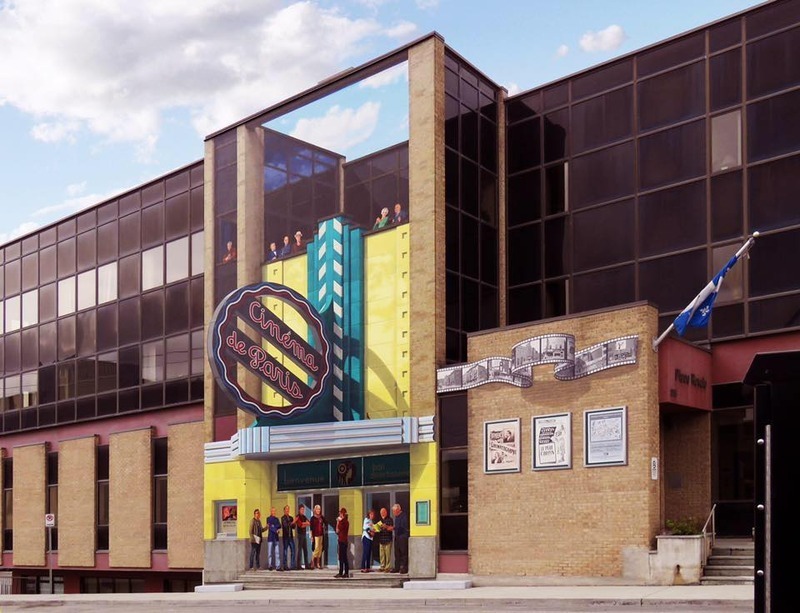 On site, you will notice that this mural presents a very interesting trompe-l'œil effect. 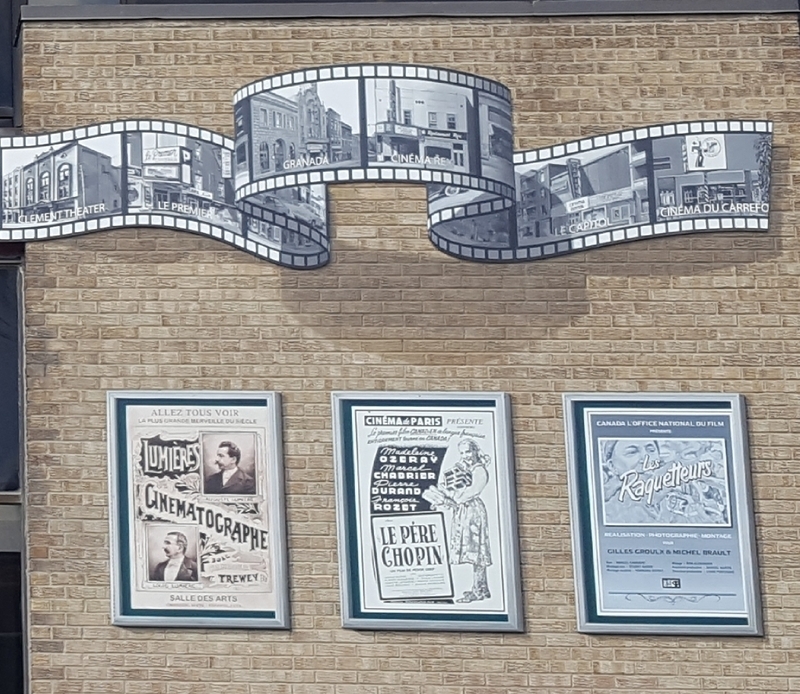 The large sign of the Cinéma de Paris is an optical illusion which, seen from the angle of Camirand et King West Streets, gives the impression that it’s perfectly perpendicular to the building. The technique used is called anamorphosis. The front view makes you lose the optical illusion. 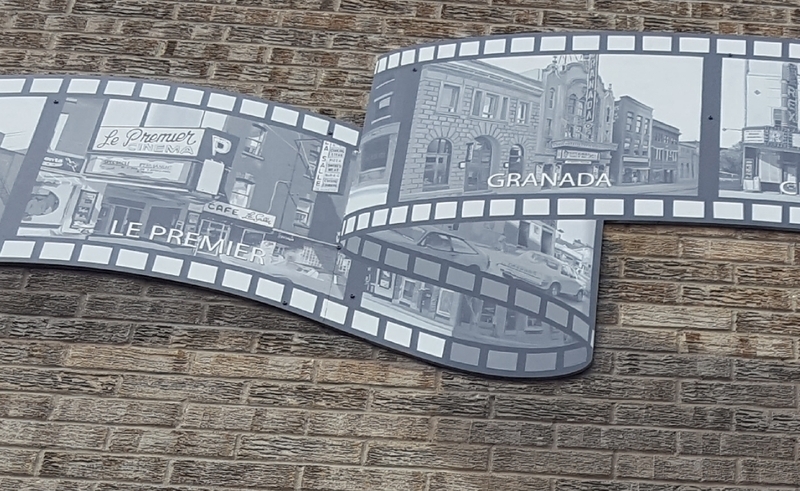 You can also acknowledge the precision and the incredible work required to achieve that mural’s trompe-l'œil effect when viewed from another perspective. Among the painted characters, you can catch sight of, among others, Anh Minh Truong (on the left), filmmaker from Sherbrooke representing the succession; Guy Jodoin (second from the left), comedian and popular Quebec television host; France Castel (in the center), actress and singer; Jacques Foisy (second from the right), ex-owner of the Maison du cinéma in Sherbrooke. You can also find: Mack Sennett, who introduced Charlie Chaplin to the world; Pauline Garon, actress in about 40 Canada-U.S. movies; Hilary Saltzman, actress; her father, Harry Saltzman, who co-produced the first James Bond movies (what he experienced during the war would be behind his fascination for spy novels); Serge Malouin, author; Maxim Gaudette, actor; Bernard Fortin, comedian; Rodolphe Vallée, director of four theatres in Sherbrooke and orchestra conductor during the representations of silent films of yesteryear. Historical research and attention to detail helped the MURIRS team to achieve this wonderful production.